What Muscles Do Diamond Push-Ups Work? A standard push-up blasts your chest muscles, but if you've already hit your bench presses for the day, you might want to target another body part. The diamond push-up — also referred to as a close-grip push-up or triangle push-up — will do just that, as it mainly targets the triceps, with a few other muscles' work for good measure. A study published in Journal of Strength and Conditioning Research in 2005 reviewed hand positions during push-ups and their effects on target muscles. Researcher determined that a narrow base position, such as during a diamond push-up, better activated the triceps brachii —as well as the pectoralis major — than a wide base position. Diamond push-ups focus mainly on the triceps brachii, the muscle that runs along the back of your arm. The triceps work in tandem with the biceps on the front of your upper arm to enable extension and retraction of your forearm. This muscle group also plays a vital role in stabalizing the shoulder, a joint with the greatest range of motion — and, therefore, the most instability — in the body. The synergists, or the muscles that help the triceps complete the exercise, in the exercise are the pectoralis major, or chest, and the deltoids, or shoulders. 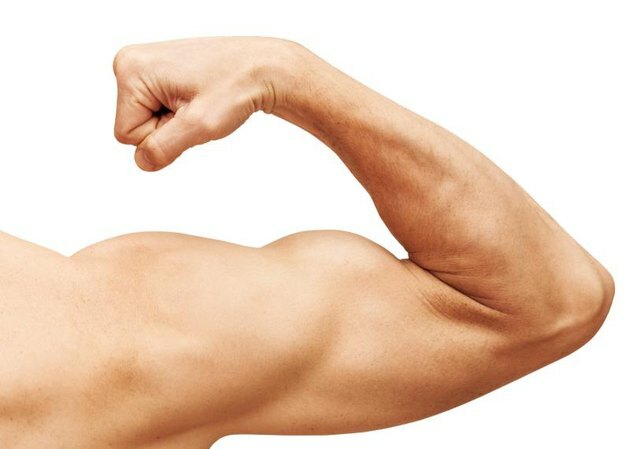 The biceps brachii work as dynamic stabilizer, which means its primary focus is assisting in keeping your joints steady, while the rectus abdominis, obliques and quadriceps also act as stabilizers to maintain your posture. Get onto your hands and knees. Position your hands so your index fingers and thumbs make a diamond shape. It might look like a triangle, depending on the flexibility of your thumbs. Bring your elbows close to your body and keep them there. Lift your legs up into a standard push-up position. Keeping your elbows in and your core braces, lower yourself until your chest reaches the ground. Return to the starting position, still focusing on keeping your elbows close to your body. You can make a diamond push-up easier or harder by playing with the incline or decline. If you put your hands on a bench and keep your feet on the floor, the push-up becomes easier. You could also lower your knees to the ground. However, if you put your feet on that bench and keep your hands on the floor, your arms lift a larger percentage of your body weight and makes the push-up harder. What Muscles Are Used in Push-Up Exercises?